Here’s an update from the road–get ready for some crappy raw images, because that’s all I have the time or energy to post (with one exception). Here’s OMNH 1331. 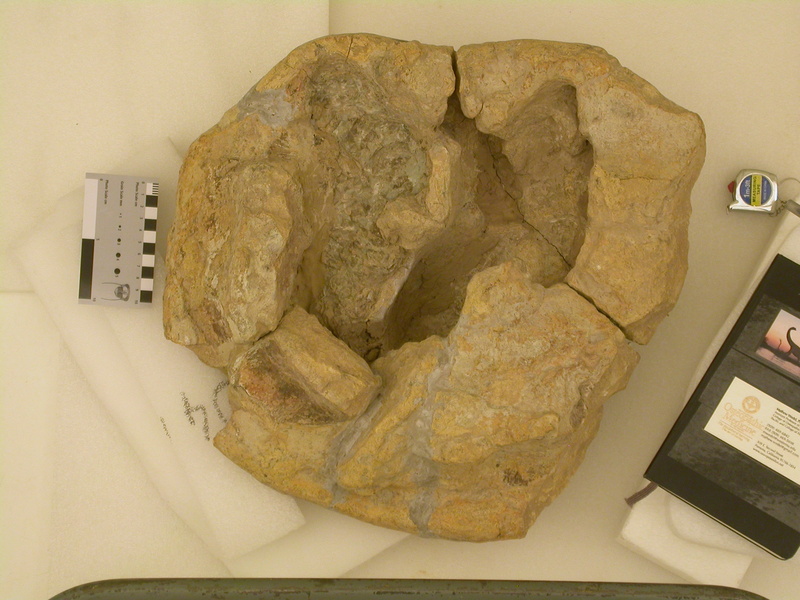 It’s just the slightly convex articular end off a big vertebra, collected near Kenton, Oklahoma, in 1930s by one of J. Willis Stovall’s field crews. 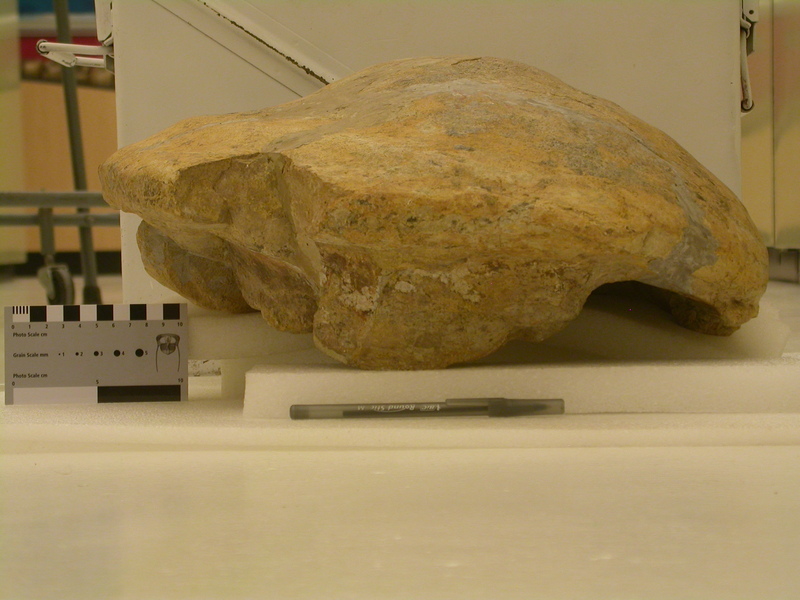 I measured the preserved width at 45 cm using a tape measure, and at 44.5 in GIMP using the scale bar in the photo, which is up on a piece of styrofoam so it’s about the same distance from the camera as the rim of the vertebra (i.e, about 8 feet–as high as I could get and still shoot straight down). So whether your distrust runs to tape measures or scale bars in photos, I am prepared to argue that this sucker is roughly 45 cm wide. There’s admittedly not a ton of morphology here, but the size and the fact that the other side is hollow and has a midline bony septum show that it is a pneumatic vertebra from a sauropod, and given that the quarry it’s from was chock-full of Apatosaurus, and liberally salted with gigantic Apatosaurus, I feel pretty good about calling it Apatosaurus. 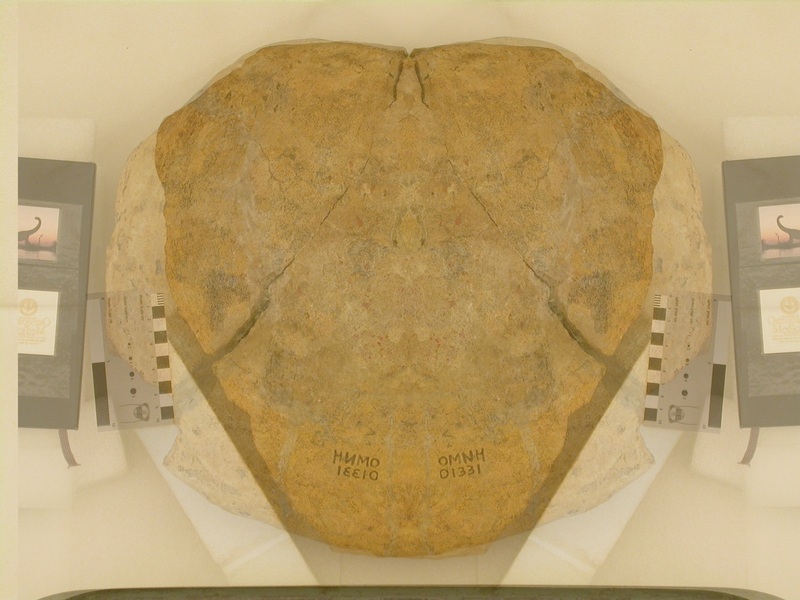 To figure out how wide the articular face was when it was intact, I duplicated the image and reversed it left-to-right in GIMP, which yields an intact max width of about 49 cm. That is friggin’ immense. If we make the maximally conservative assumption that this is the largest centrum in the whole skeleton of a big Apatosaurus, then it has to be part of a dorsal vertebra. Here are the max diameters of the largest dorsal centra in some big mounted apatosaurs, taken from Gilmore (1936). The number in parentheses is how many percent bigger OMNH 1331 is. However, this might not be part of a dorsal vertebra. For one thing, it’s pretty convex, and Apatosaurus dorsals sometimes have a little bump but they’re pretty close to amphiplatyan, at least in the posterior half of the series. For another, I think that smooth lower margin on the right in the photo above is part of the rim of a big pneumatic foramen, but it’s waaay up high and pretty medial on the centrum, opening more dorsally than laterally, which I have seen a lot in anterior caudal vertebrae. Finally, Jack McIntosh went through the OMNH collections years ago and his identifications formed the basis for a lot of the catalogue IDs, and this thing is catalogued as the condyle off the back end of a proximal caudal. Here are the max diameters of the largest caudal centra in those same mounted apatosaurs, again taken from Gilmore (1936). Once again, the number in parentheses is how many percent bigger OMNH 1331 is. So whatever vert it’s part of, OMNH 1331 is damn big bone from a damn big Apatosaurus. 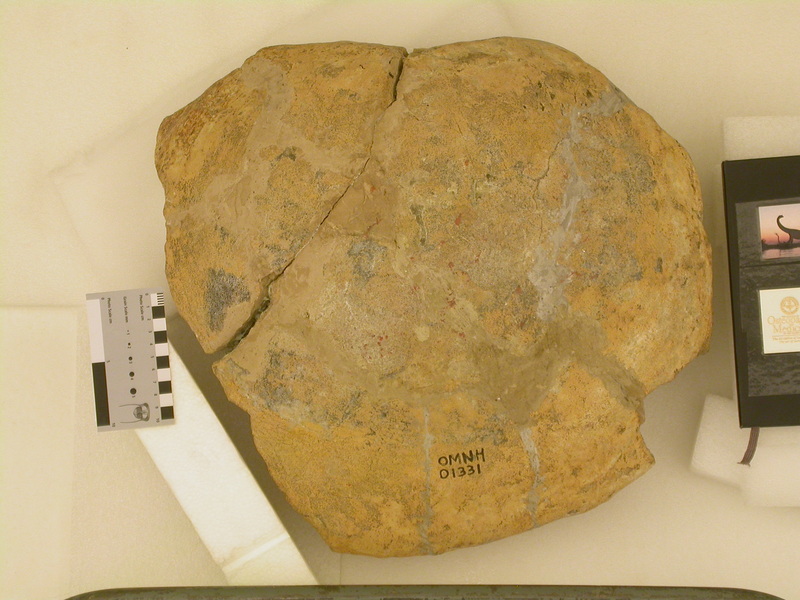 There are lots of other big Apatosaurus vertebrae in the OMNH collections, like OMNH 1670, but OMNH 1331 is the largest centrum that I know of in this museum. Which is why you’re getting a post about most of one end of a centrum in the wee hours of the morning–it’s most of one end of an awesome centrum. And it pains me when people do comparison figures of big sauropod vertebrae, or lists of the “Top 10 Largest Sauropods”, and put in stuff like Argentinosaurus and Puertasaurus and Supersaurus, but leave out Apatosaurus. It was legitimately huge, and it’s time the world realized that. Is it A. ajax? I’m under the impression that it was the most derived species and like the contemporary taxa, also the biggest representative of its genus. Who knows? Size alone is about the most godawful phylogenetic character one could choose. There is enough Apatosaurus material in the OMNH collections to sort out what it is, especially since there is already a specimen-level phylogenetic analysis of Apatosaurus (Upchurch et al. 2004), but that’s a lot more work than I’m going to get done on this short trip. As I said in the OMNH 1670 posts and their comment threads, what we need is for some ambitious OU grad student to take this on. Anyway, I think it’s a mistake to automatically assume that it has to belong to one of the existing species. FMNH P25112 apparently doesn’t. I don’t think we’ve exhausted the diversity of Apatosaurus yet, and given that the Oklahoma material is geographically distant from the well-known representatives of the genus AND has some odd features, I think it is possible that it might be a new species. But like I said, that possibility will take a lot more work to properly explore. Just how big is a standard Apatosaurus of each species anyway? I’ve heard anything from 20-26 meters widely quoted. I’m glad you guys are out there illuminating these wonderful mystery bones. Apatosaurus really does deserve more respect! Let’s call it “Brontosauros”. You know you want to. In the case of Apatosaurus, I wonder whether perhaps the differences between the distinct taxa are minimised in people’s mind by their all being referred to by the same name. But I am very far from being an apatosaur expert, and that judgement is for others to make. If you can tell at this point: how does OMNH 1331 compare with OMNH 1670? how does OMNH 1331 compare with OMNH 1670? So there’s no consistency here, you find bigger and smaller numbers in no predictable order. I don’t think there’s much a biological story there; things vary (although it is tantalizing that you get some of the smaller centra in the middle where they’re more distant from both the shoulders and the hips). Back to the dorsal-caudal comparison: in CM 3018 and FMNH P25112, the smallest dorsal is still larger in diameter than the biggest caudal, but that is not true of UWGM 15556. Frankly the biggest caudals and smallest dorsals are so close in size that it’s basically a wash. So I think it’s possible that OMNH 1670 and OMNH 1331 could belong to the same individual–in fact, I think it’s possible that all of the really immense Apatosaurus material from Kenton Pit 1 belonged to one individual, although there were other, smaller individuals in the same quarry, like OMNH 1382 (scroll down to Figure 6 here). I just like OMNH 1331 because it’s a larger thing. It’s not very often I get to get my hands on a real fossilized vertebra half a meter in diameter. …of course, if OMNH 1331 and OMNH 1670 are part of the same animal, the fact that OMNH 1331 is a bit bigger than OMNH 1670 suggests that OMNH 1670 is not the largest dorsal in the series, diameter-wise, and that the actual largest dorsals in that individual were larger in diameter than OMNH 1331–so, more than half a meter diameter. That’s pretty not bad. How long would the reconstructed centrum be? Do these big vertebra, includeing OMNH 1670, scale up isometrically in all dimensions from smaller individuals of the same genus? Depends on which vert it is, but most of the dorsals are about as long as wide, so around half a meter. You mean in terms of their own shape, or in terms of size relative to other elements in the skeleton? Actually, I don’t think it matters: the answer is yes in both cases. On the verts being the same shape as smaller verts, they pretty much are. OMNH 1670 looks like somebody took a normal Apatosaurus vert and blew it up in some kind of 3D printer from hell. Ditto for everything else. Thank you for your timely response Matt. I meant in terms of their own shape. So is it valid to say that Apatosaurus’ body proportions remained the same from sub-adulthood to adulthood and scaling up an individual like CM 3018 would pretty accurately represent larger, perhaps more mature individuals? Those are some really big Apatosaurus bones. I don’t recall many sauropod vertebra much larger than these; those Argentinosaurus dorsals are only slightly larger right? Based on everything I know right now, the answer to all of your questions is yes, except that the neck might have continued to get proportionally longer, which we know it did between babyhood and (sub)adulthood. At some point I’ll put together a comparative fig showing OMNH 1670 and OMNH 1331 with vertebrae from Supersaurus, Puertasaurus, Argentinosaurus, Amphicoelias fragillimus, etc. D10 of the giant Oklahoma apatosaur would have been scary big. I played a bit with numbers to estimate how big Apatosaurus was, in light of OMNH 1670 and OMNH 1331. I used “classic” length estimates of 21-26 meters and mass estimates of 18-36 metric to tons, and isometric scale change to get that Apatosaurus was somewhere between 26 to 33 meters long and weighed 36-73 metric tons. Taking average and based on Scott Hartman’s diagram I put the estimate of Apatosaurus to be about 29-30 meters long and with mass of 48-54 metric tons. These numbers put Apatosaurus as one of the largest Jurassic dinosaurs but still a bit smaller than Cretaceous titan Argentinosaurus and kin. Few remarks: Apatosaurus need to be at least 30 meters long to enter the “giants hall of fame”. Mass of 50+ tons is impressive but not so uncommon.